16 October 2016 Ennis, TX- Shawn Baca and Industrial Injection set out at the beginning of the 2017 Season building a truck that could compete in drag racing, sled pulling and dyno competitions. Their work of art became known as the Master Shredder. No one knew at the time that their project would become a championship winning truck. 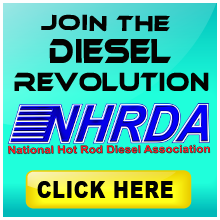 Baca, who resides in Salt Lake City, Utah and works for Industrial Injection, didn't make his first NHRDA event of the season until the Rocky Mountain Diesel Nationals presented by Industrial Injection on July 13th & 14th. Shawn has a very unique truck that can compete in both the NHRDA Hot Shot's Secret Diesel Drag Racing Series and the NHRDA Diesel Sled Pulling Series and this event was a perfect opportunity to make its NHRDA debut. 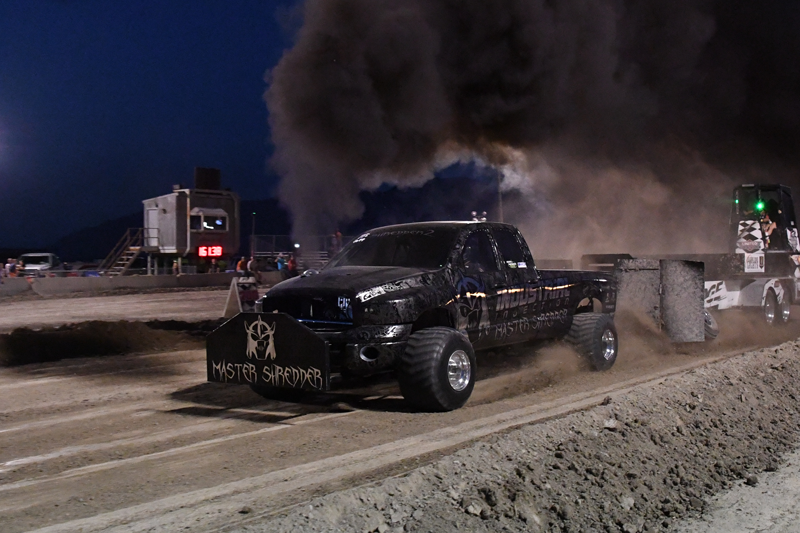 In Utah he competed on the Friday night in the Pro Street class picking up the win along the way. 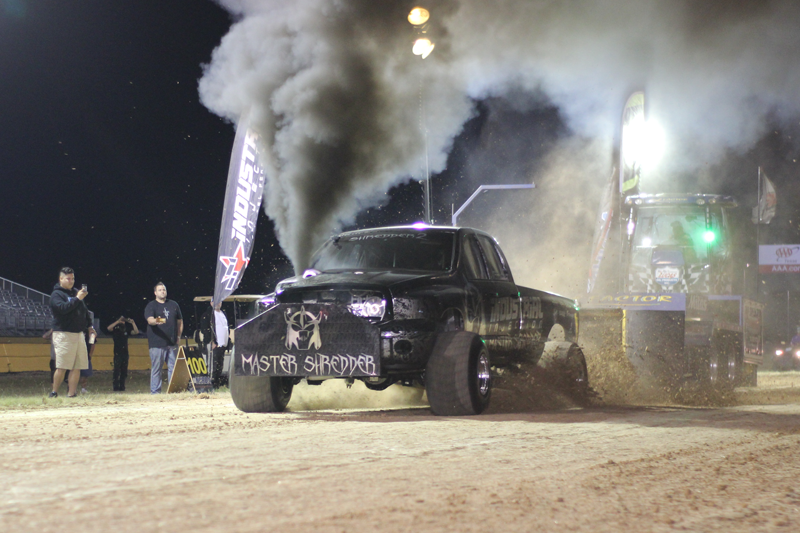 But it was Saturday at the sled pulls that Baca got his first taste of the NHRDA Diesel Sled Pulling Series. The sled pulls were a partnership between the NHRDA and the United Truck & Tractor Pullers so Baca was looking forward to earning points for both series at the same event. Baca and the Master Shredder are always a fan favorite no matter what track they are at and at the Rocky Mountain Diesel Nationals they put on a great show for the fans at the event and on Diesel TV. 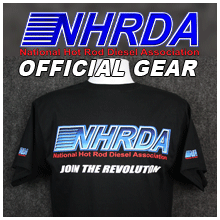 Baca and his truck were able to go a distance of 332.08 feet which was good enough for a 2nd place finish in one of the toughest Super Stock fields in the history of the NHRDA Diesel Sled Pulling Series. 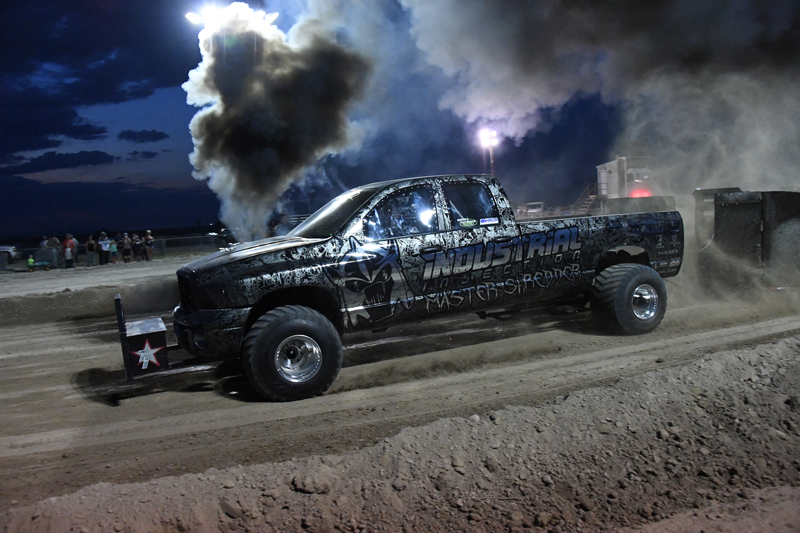 The next scheduled event on the NHRDA Diesel Sled Pulling Series was the Big Sky Truck Fest presented by G & J Diesel in Billings, Montana. Baca and crew knew that they had the truck that everyone wanted to beat that night at Yellowstone Drag Strip. Baca rolled up to the starting line knowing that he would need a good distance if he wanted to leave Billings with the trophy. Things didn't go as planned as the truck had mechanical issues and was only able to record a distance of 173.78 feet. It wasn't the performance Shawn and his team was looking for, but it did give them the points lead for the Super Stock National Championship. 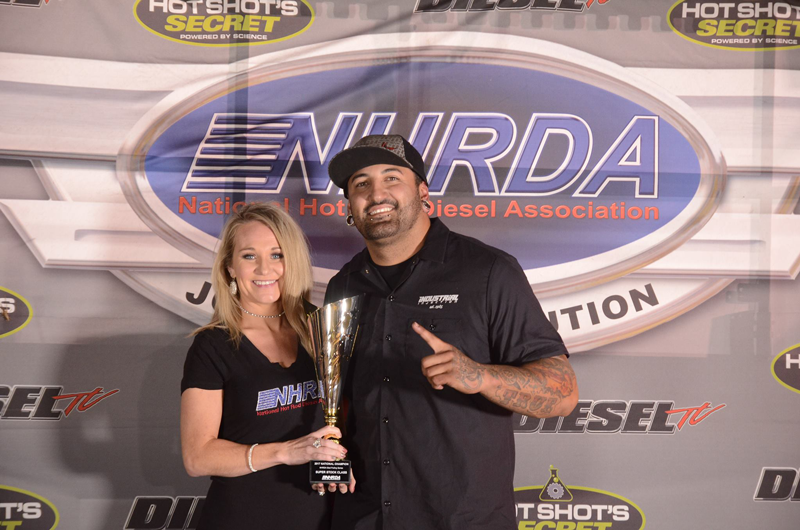 It all came down to the NHRDA World Finals at the Texas Motorplex. 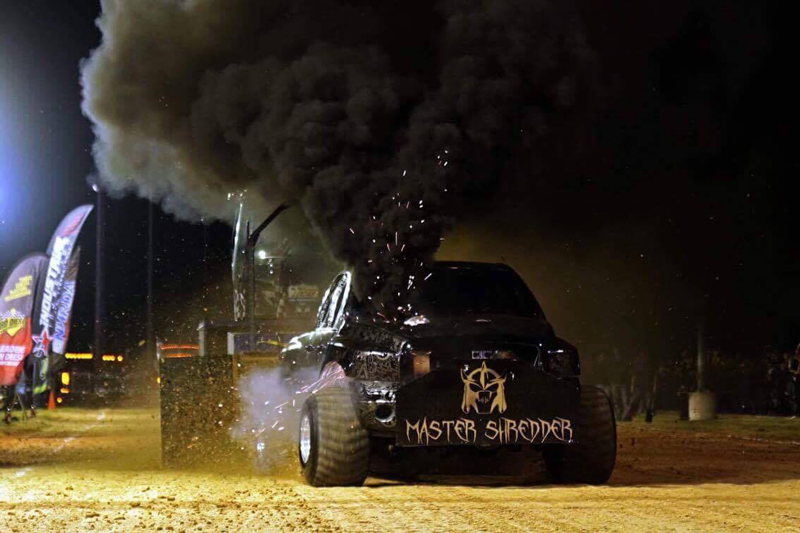 The Industrial Injection team and Master Shredder came to Texas knowing that they had already clinched the 2017 NHRDA Super Stock National Championship but now at the biggest event of the year they wanted the NHRDA World Championship as well. Baca wanted to add the NHRDA World Championship Ring to his trophy case. Baca's night started out well and he was about 200 feet down the track when the truck started to struggle a little and then BOOM! The right side of the engine flashed flames and metal parts went flying everywhere. Baca had exploded the turbo and there were pieces of the turbo all over the track. There would be no World Championship Ring for the Master Shredder. "We started messing around with the Sled Pulling and were chasing the World Championship Ring. We locked up the National Points Championship but missed out on the ring this year," said Baca in the Winner's Circle. 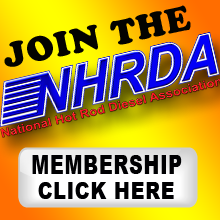 "It's the first time we have chased the NHRDA tour with this truck. 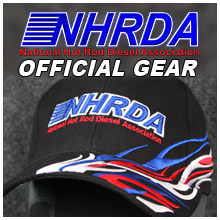 Normally we are drag racing with the NHRDA and it was good to go home with a National Championship." Shawn was very thankful to the people that helped him get to where he is, "Without the help from everybody I wouldn't be here honestly. A big shout out to Industrial Injection and everyone there and back home, they are my team. I want to thank Valair Clutch, Hamilton Cams, RKO, Schmidt Body and Paint and Diamond Pistons." Baca will now focus on getting his truck set up and ready for drag racing this winter and trying to get the bugs worked out of that program. Expect to see Baca and the Master Shredder coming after a World Championship Ring!